A travel photo blog NOT a travel guide. Sharing what I discover on trips Home to Italy that most tourists never see Be a traveler NOT a tourist! Walking the lanes and streets of charming Italian villages or the larger avenues of major Italian cities, I can experience Italian lifestyle from ground level. To appreciate the scope of the city and the surrounding countryside you must climb. While Italian towns usually have a major church, some include a bell tower, other towns may have the remains of a fortress with surviving watch towers that offer a panoramic view of the city as well as the surrounding countryside from above the roof tops. Ground views of a city are charming. Climbing a tower can afford a 360 degree view that is often obscured when exploring from ground level where the streets may wind around natural contours. Tourists may recognize the leaning tower in Pisa, Giotto's tower in Florence, the roof of Saint Peters' in Rome, Milan's cathedral roof top and St Mark's Campanile in Venice. To avoid the line to enter the Venice Campanile, there are other options that are open to the public and offer a 'view'. The roof top view overlooking the grand canal from the top of the former post office near the Rialto bridge, Fondaco Dei Tedeschi, (DFS) is one option. Centrally located and free (as of my visit in 2018) you reach the roof via an elevator! I must have passed this multi storied building many times without realizing it had been transformed into a unique shopping experience. On-line historic data dates the building from 1228 and rebuilt in the 1500's after a fire. The four story building surrounds an inner courtyard, which now has a glass ceiling. An original fireplace and a well can be found on the first floor. The DFS store brochure and where-venice.com added more details on the buildings' past. Over the centuries the building was a palace, warehouse and later a market. The ground floor water access would have given the building easy access to the merchants who traded here. Higher floors were apartments for merchant families..
Later the building was used as a post office. The four story building surrounds an inner courtyard which now has a glass ceiling. Be sure to look UP! The store is filled with wonderful high end fashion items, cosmetics and gift ideas. Enticing displays along the wide corridors on each floor only suggest what additional items are found in the rooms of designer fashions beyond. Black suited sales staff are close by to assist all shoppers. All of the sales staff I met spoke English and were helpful and attentive even if you do not make a purchase. You must ask for an English version of the free brochure, available at the information desk. The large, open space on the first floor originally was a courtyard with access to the canal via the large arched doorways. Today the first floor offers a restaurant with table service as well as the amazing view up to the top floor. There is a small coffee/cake location on one side of the atrium. Tables surrounding the restaurant are filled with unique and colorful gift items or souvenirs. But I was here to visit the roof top deck. The elevators at the back of the store take you up to the 4th floor. Visits to the terrace are free but are limited to 15 minutes. The number of visitors for each time slot are controlled and guests must reserve a time online or at the computer stations on the 4th floor. Bring your confirmation with you on your phone or a printed copy. You wait for your assigned time to visit the roof here in the events space. There was a large group waiting in the events area prior to being allowed on the terrace. The line moved quickly to climb up to the terrace. After a few minutes there were breaks in the crowd taking selfies, so others could finally enjoy the novel view. There is a 360 view of the roof tops in the city and with the use of a telephoto lens or later photo enlarging, you can see details of many of the other buildings in the city. If your trip does not allow enough time to book a terrace visit, there are some hotels, palaces and museums that can also offer great views as well as a peek into what life was like hundreds of years ago. Let me know what your favorites are. Scala del Bovolo, stairway to heaven, is off Campo Manin. Winding your way to the top of the building exposes more and more of the city until you have a view of rooftops and churches as well as St. Mark's Campanile. This is an easy climb, one of my favorite experiences. The tower of San Giorgio Maggiore offers a view towards San Marco and the waterfront of Venice. 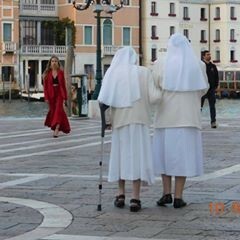 You will find fewer tourists on this island and an excellent way to avoid the line at San Marco. This is an active bell tower, you may wish to time your climb accordingly. The island of Torcello* has a tower in the small central square. Reid's Italy* has a good description of this tiny island. Always check online for current times the tower may be open. Major bridges crossing the Grand Canal can offer a view without the climb. The top of the Accademia bridge and the Rialto bridge are popular photo stops, but often the crowds do not let you linger very long. The newer (2008) Ponte della Constituzione or Ponte di Calatrava a Venezia linking Piazza Roma and the Ponte degli Scalze in front of the train station. The latter is the first opportunity for tourists to experience the sweeping view of the canal after arriving by train. So much to see. Only a few days in Venice is never enough time. Most data is found on Wikipedia and not guaranteed by this site, be sure to check times and prices for any site mentioned here. Although I appreciate your comments, promotional links will not be posted. If you need a response leave your email address. For international visitors, please send comments translated to English. Venice: What do gondoliers wear on their feet? 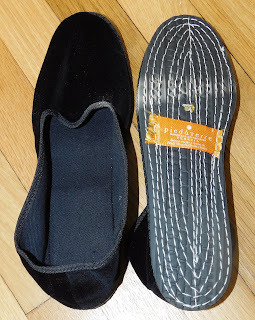 What do gondoliers wear on their feet? When you think of Venice, the first thought may be the iconic gondola ride along the grand canal or on one of the quiet canals traversing the many islands that make up this city. .
You can enjoy watching the approximate 400 glossy black gondolas silently passing from the top of a bridge and on occasionally hear the echo of a gondolier serenade. 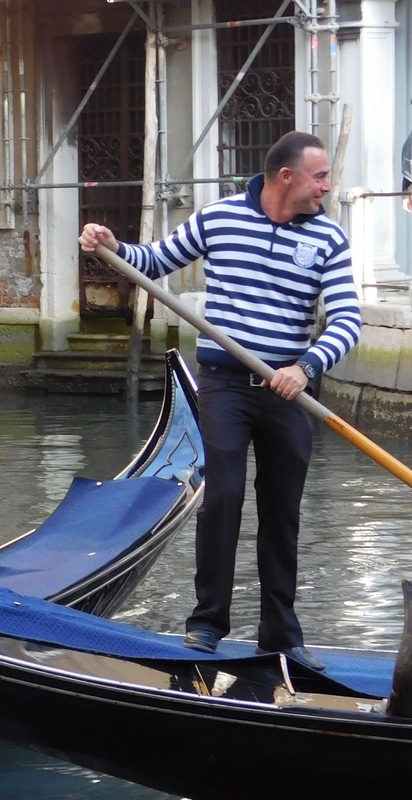 Gondoliers dress in the official ‘uniform’ of navy or red striped shirts, dark pants and often the iconic straw boater, according to Venice Insider. An official clothing store at the foot of the Rialto bridge, Emillio Ceccato, is where you can purchase authentic items. When a number of gondoliers are clustered together, sight site is photo worthy! You can usually find a group of gondoliers at one of the 'gondola stations' throughout Venice, waiting for the next passenger. On an earlier visit to Venice, Elizabeth Rainer, one of the three contributors to ‘My Pretty Venice’ a guide to finding Venice artisans and experiences (ISBN-10: 8873017746), introduced me to several of the artisans/shops included in the guide. One of our stops was near the Rialto Bridge, S. Polo, # 60, to learn about the shoes sometimes called gondolier slippers or le furlane. When you enter this compact store, you are assailed by the riot of color from the floor to almost ceiling, cubicles holding furlane in linen, velvet and some novelty fabrics. It is not difficult to imagine women sitting in their homes homes producing slippers and using the proceeds from the sale of this simple product to supplement the family's income. Today you can find the slippers in several styles and many fabrics or bring your own fabric to have a pair custom made. On this return trip to Venice I wanted to experience a pair of furlane. I passed on a store off the main tourist route, selling a lovely selection because they were not made in Italy. Once I revisited Piede a Terre the problem was making a choice: first the style, then the fabric and finally the color. Furlane are made for men and children as well, so you might find all your gifts in one location. Do gondoliers still use furlane? My search resulted in shoe-less, sneakers or trainers as you may call them and dress shoes, but I did not find any furlane. 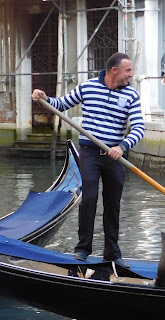 Have you seen a gondolier wearing furlane? This gondolier chose to work in socks! During my online search, I did find many things about gondolas and gondoliers. Gondolas have been plying the waters around Venice for centuries. After the introduction of the faster, motorized vaporetto, the need to use a gondola to travel the canals was reduced. There may still be some privately owned gondolas (Peggy Guggenheim enjoyed a private boat and must have had her own boatman) but you find most of the 400 + remaining gondolas offering the unique experience to visitors. If you are brave enough to cross the grand canal standing up in a Traghetto with several other passengers, your experience may be somewhat different. Not on my list of travel experiences. Perhaps the best know boat yard is the squero di San Trovaso, not far from St Marks square. How to obtain a license as a gondolier, a short overview, far more information and details are available online. 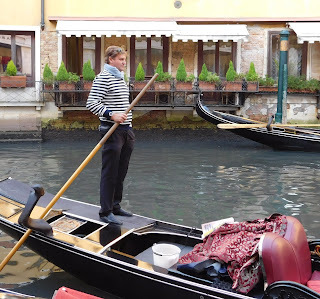 The career of gondolier is usually handed down from father to son over the years. First, a candidate must pass tests for rowing and swimming before continuing to the formal gondoliere school, a course lasting up to 18 months. Gondoliers must know the history and geography of Venice as well as speak sufficient English. Exams must be passed before a student advances to a substitute gondolier assigned up to a year as a traghetti di parada, the cross canal passenger boats. Gondoliers had been a male only profession until 2010 when Giorgia Boscolo, the daughter of a gondolier, passed the exam. Again Venice Insider was my source for this information but several other articles have been published. Chiara Curto has also been authorized to use a sandolo: smaller and flatter than a Venetian row boat. When you visit Venice try to notice the unique design of the asymmetrical gondola and how the gondolier stands to one side. With practiced strokes the boatman can maneuver the 35+ foot long gondola around corners, around other boats and close to a stairway to embark passengers. A boat serves as a perfect neighborhood fruit and vegetable stall. The locals stop by daily. Perhaps the best known book store in Venice is Liberia Acqua Alta where a gondola is the center piece. There is so much more on the history of Venetian gondolas so be sure to do an online search to learn more. 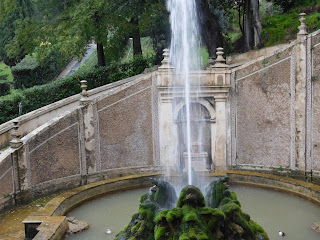 unless it is the only day you can visit the famous garden in Tivoli Italy. 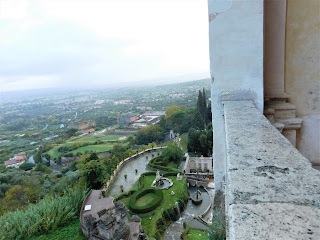 My day to see Tivoli, after 5 years of saying 'I need to go there', was during a heavy rain storm in Rome. It is an easy train ride from either Termini train station or Triburtina and takes approximately an hour. No other passengers clutching tour books or maps, just a few day shoppers and lots of students. Signage to the villa is sparse. After you exit the train station take the bridge across the river and head uphill. Having no map and not finding the tourist office, I used google maps and as usual was taken on a wild ride. However, I did see some charming parts of the town that will have me returning for another visit when it is not raining! The ticket office hall leads you to the courtyard. On the opposite side you will find a small room to store bags/coats etc while you hike the garden. The friendly woman behind the counter did not ask for any fee as I took the key from the locker I had put my back pack in. She reminded me the closing time had changed since this was the first week of daylight savings and we had a chat about reading. Since I speak very limited Italian it was very kind of her to spend any time chatting but she enthusiastically told me how much she enjoyed the author she was reading. The small joys of interacting with Italians. There was limited daylight left so I opted to spend my time exploring the gardens and left the massive villa for another day. You must go to the ground floor (basement) to access the garden. There are several verandas and patios off the villa that offer a view of the treetops and some of the water art. With no directions on which exit to use I took the elevator to a lower floor where I found a door that led to the stone terrace and more flights of stairs to lower parts of the garden. There are fountains everywhere! There is rushing water playing music whenever you near a fountain. The gardens go on but I may have only seen a small portion after a few hours. Navigating the slippery steps and landscaped inclines became an effort after a few hours in the downpour. The sound of all the rushing water battled with the many fountains and waterfalls. The hundred fountains stretched across the front of the villa. 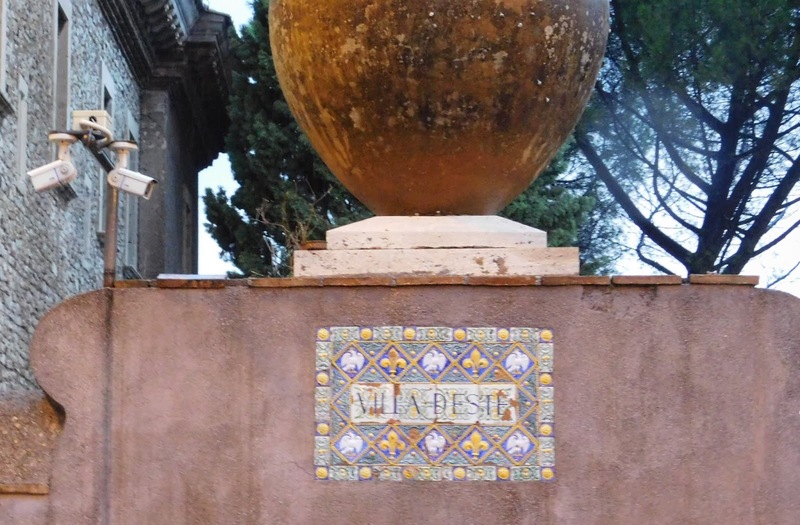 Great descriptions of the garden features and the villa's history can be found at Wikipedia. There were only a few other visitors in the gardens. Fountains and water falls competed with the downpour. Why is the Speedo popular in Italy? Copyright @2010. Ethereal theme. Powered by Blogger.